An overlooked question in the debate over President Trump’s trade policy is “Why has the U.S. reversed long-standing positions on free trade?” It is important to ponder this question, especially for supporters of free trade. Reversals of long-standing positions are usually rooted in deeper changes. Understanding these deeper changes are important to understanding how policy may evolve and to positioning ideas for influence. Objective of this article is to encourage discussion of this strategic question. The article is in part speculative given the recent nature of the question. The proposed answer is the rapid decline in U.S. share of world economic growth since the turn of the millennium. Gross domestic product (GDP) is collected from the International Monetary Fund’s (IMF) October 2017 World Economic Outlook database. 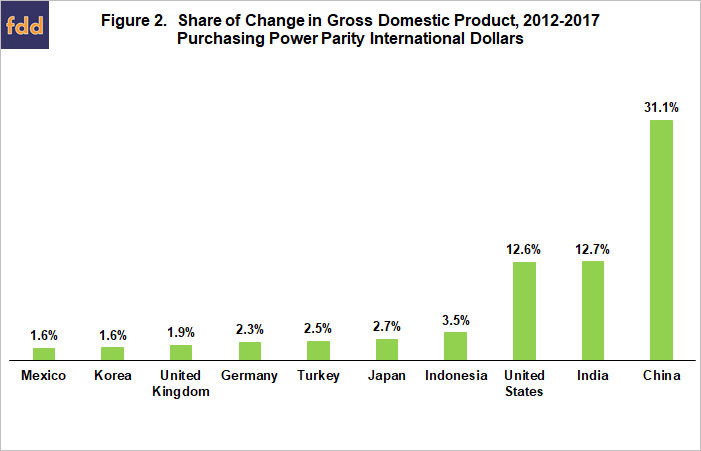 GDP is measured in international dollars adjusted for purchasing power parity of a country’s currency. Most economists consider this adjustment to be the most appropriate when comparing economic variables across countries. The analysis spans 1980-2017 (1980 is the first year of data on GDP). To dampen short-term aberrations, growth in GDP is calculated over 5 years. Between 1980 and 1985, the U.S. accounted for 24.6% of world economic growth (see Figure 1). Since then, 2 distinct periods emerge, with the millennium being the break point. Until 2000, U.S. share fluctuated around a very slight downtrend. U.S. share of world economic growth was still 24.1% from 1995 to 2000. Since 2000, U.S. share has dropped at an annual rate of around -0.7 percentage point per year. 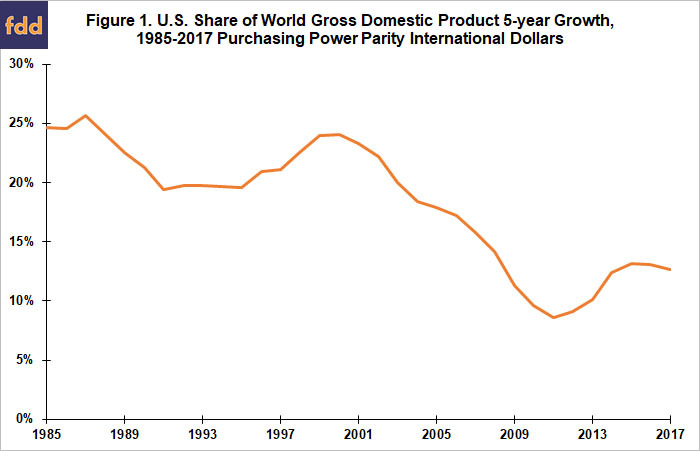 U.S. share was 12.6% of world growth between 2012 and 2017. Over 2012-2017, U.S. share of world economic growth was well less than half of China’s 31% share (see Figure 2). The U.S. was not even 2nd as India nudged it out. A common measure of a country’s economic size is its gross domestic product, but arguably a more important measure is its contribution to world economic growth. Economics has clearly established that free trade increases economic growth. However, free trade also produces losers, specifically firms and their workers who do not have competitive advantage. Economics has clearly established that a factor, such as freer trade, which spurs economic growth leads to even more growth. While less than the initial growth, the additional growth can be notable. As the U.S. role in world economic growth has shrunk, its share of freer trade’s additional growth has shrunk. This dynamic has changed the math of the U.S. position on freer trade. When the U.S. share of world economic growth was larger, it could consider whether it might take a smaller initial share of the benefits of freer trade since it was a major beneficiary of the additional world growth. Since its share of additional growth is now smaller, the U.S. is likely to focus more on capturing a larger share of the initial benefits of freer trade. The preceding change in U.S. bargaining position will be seen by many as a step back from its leadership role on freer trade. This may be true, but it may also be that the U.S. is only reconfiguring its negotiating position. Only time will tell when of these two storylines plays out. Also receiving little attention in the current debate over trade is how to help the losers from freer trade. The U.S. has never made a firm commitment to trade adjustment policy. A simple means to fund such a policy is a small tax on exports. Free trade winners thus fund assistance for free trade losers, which, besides helping the losers, would also likely bolster public support for free trade. In closing, this article is an attempt to encourage discussion and analysis of why the U.S. position on international trade is in flux. Without such discussion and analysis, the U.S. is unlikely to fully benefit from its national debate over trade policy.